Grandeur and serenity. That’s what you feel when you enter the streets of Hóra (Chora) and the monastery. 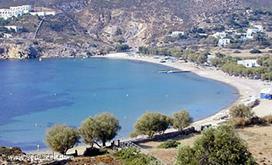 For many years, Patmos has been frequented by intellectuals, artists, royalty and celebrities from all over the world. Worldwide known as a sacred island for it is the place where Saint John wrote the Book of Revelation, Patmos is an ideal destination for nature lovers thanks to its lace-like coastline, sheer cliffs and volcanic soil. The landscape of the island’s capital is dominated by the 6th century fortress monastery of St. John where many important religious relics can be seen. In the area of Hóra (Chora), little glittering white houses under the Aegean sun stand next to proud two-storey mansions. Following the historical narrow streets all the way from the monastery down to Skála (the island’s port), one will discover restaurants, cafés, shops and traditional bakeries. High on the hill above Hóra, The Monastery of St John the Theologian is an important centre of worship. This monastery, with its significant religious history and imposing architecture, rises grandly over the Aegean and dominates the life of Patmos. The monastic community here has existed for over 900 years and the relics, rare documents, icons and other Orthodox treasures in the monastery are invaluable. 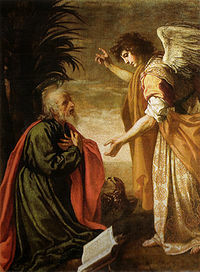 According to the prevailing theory, the Book of Revelation was written in 95 A.D. in the Holy Cave of the Apolacypse, where St. John heard the voice of God talking to him. Turned into a place of worship by the monk Christodoulos Latrinos in the 11th century the cave –on whose walls we can trace the fingerprints of St. John’s himself–, is still open to the devout Christians. The largest settlement, as well as capital and port of the island, is Skála where you will find accommodation and fresh-fish tavernas among buildings used by the Italians during the Italian Rule of the Dodecanese (1912-1943). The beach in Kámpos with sea sports facilities and marvelous fish tavernas is the most cosmopolitan one, whereas Psili Ammos (literally meaning “thin sand”) will offer you an off-the-beaten-track experience as it is accessible only by boat. For cool and not very salty waters the beach of Váya is definitely the choice, whereas Sapsilas with its warmer waters will be the refuge for the less courageous ones. The beach of Lámpi is very beautiful, covered with colourful pebbles. The very small and mainly uninhabited islets of Arkoi are absolutely worth a visit, by catching a boat from Skála, and making sure to call in at Maráthi for crystal clear waters and fresh delicious fish. At 5km from Skála, the small fishing village of Grikos with few inhabitants, has a mystic scenery. Along the cozy bay, one will admire all colors of the earth. Starting from the small cape in the northern part of the bay, from where you can gaze at Hiliomodi, an islet hosting the chapel of Saint Panteleimon. Kalikatsou Rock stands centry at the tip of a narrow spit of land separating Grikos Bay (foreground) from Petra Bay on Patmos. It looks like a sculpture in the sea, a significant archaeological site, that researchers believe it was once a temple of Aphrodite. The view from the top is breathtaking, as the Aegean Sea unfolds at your feet. Tragonisi, the small island which is used as pasture for sheep and protects the bay from strong winds, reveals its feminine curves. 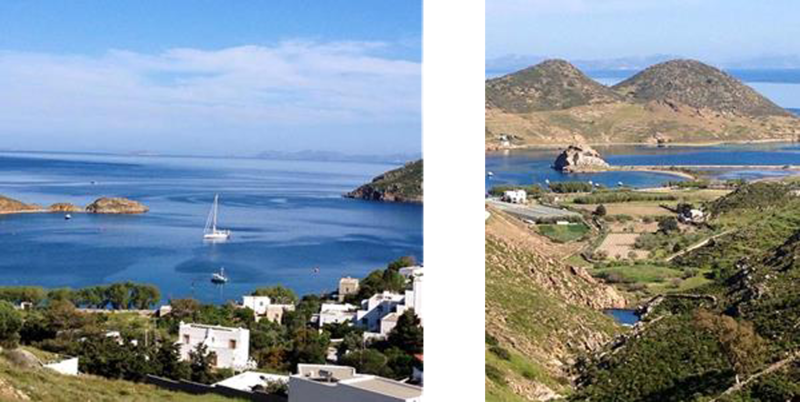 The trip to Patmos by hydrofoil ("flying dolphin") takes approximately 2 hours from Kos. It departs early in the morning, reaching the island around 10.30 am. If you visit just for one day, it will be wise to get on an organising day tour; as soon as you arrive a bus will take you to the Monastery that is built high on a rocky hill. You will have time to stroll around and visit the museum that is there. You will also visit the cave where St. John received the revelation. You will also have time to walk through the main village of Chora. The above mentioned Dodecanese islands have airports from where visitors can reach Patmos through regular ferry connections, especially during the summer season. Patmos is seldom mentioned by ancient writers. Therefore, very little can be conjectured about the earliest inhabitants. In the Classical period, the Patmians prefer to identify themselves as Dorians descending from the families of Argos, Sparta and Epidaurus, further mingling with people of Ionian ancestry. During the 3rd century BC, in the Hellenistic period, the settlement of Patmos acquired the form of an acropolis with an improved defense through a fortification wall and towers. After the death of John of Patmos, possibly around 100, a number of Early Christian basilicas were erected on Patmos. Among these was a Grand Royal Basilica in honour of Saint John, built c. 300–350 at the location where the Monastery of Saint John the Theologian stands today. 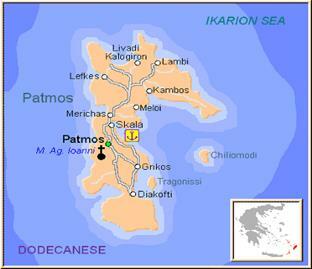 Early Christian life on Patmos, however, barely survived Muslim raids from the 7th to the 9th century. During this period, the Grand Basilica was destroyed. In the 11th century, the Byzantine Emperor Alexios I Komnenos gave Christodoulos the complete authority over the island of Patmos, as well as the permission to build a monastery on the island. The construction of the monastery started in 1101. It was under rule of Republic of Venice between 1207 and 1340 and then Knights Hospitaller between 1340 and 1522. Buildings of different ages form the Monastery, comprising 10 chapels and 99 cells as well as a Library of 890 handwritten codes and 13,000 documents about the history of the site. Nowdays, around this Monastery revolve Holy Week and Easter celebrations every year. Population was expanded by infusions of Byzantine immigrants fleeing the Fall of Constantinople in 1453, and Cretan immigrants fleeing the fall of Candia in 1669. The island was controlled by the Ottoman Empire for many years, but it enjoyed certain privileges, mostly related to tax-free trade by the monastery as certified by Ottoman imperial documents held in the Library. Ottoman rule in Patmos ("Batnaz" in Ottoman Turkish) was interrupted by initially Venetian occupation during Candian War between 1659 and 1669, then Russian occupation during Orlov Revolt between 1770 and 1774 and finally during Greek War of Independence. In 1912, in connection with the Italo-Turkish War, the Italians occupied all the islands of the Dodecanese (except Kastellorizo), including Patmos. The Italians remained there until 1943, when Nazi Germany took over the island. In 1945, the Germans left and the island of Patmos remained autonomous until 1948, when it, together with the rest of the Dodecanese Islands, joined the independent Greece.